There was a tradition in cigar factories in Cuba and America, where cigars are rolled by hand, in which a person called a lector read aloud from books or newspapers to the factory workers while they worked. What a lovely lost (at least in this country) tradition. There's something rare and magical about being read to, and in this case it's how the workers received their education. And it allowed them to escape with their imaginations into another world while they continued with their manual labor. Our story takes place in one such factory in 1920s Tampa. 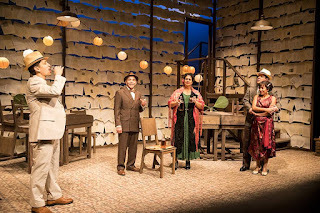 Ofelia (Adlyn Carreras) and Santiago (Al Clemente Saks) own the factory, and their daughters Marela (Cristina Florencia Castro) and Conchita (Nora Montañez), along with Conchita's husband Palomo (Rich Remedios), are among the workers. Santiago's recently discovered half-brother Cheché (Dario Tangelson) helps run the factory and is in mourning for his wife, who ran away with a lector. Needless to say he isn't too pleased when Juan Julian (Juan Rivera Lebron) arrives to be the new lector, but the women, especially naive young Marela, can barely contain their excitement. He begins to read Tolstoy's Anna Karenina, and the story of a wildly romantic yet ultimately devastating affair affects the characters in equally romantic and devastating ways. Andrea Heilman's set design, combined with Barry Browning's lighting design, is simply beautiful. The backdrop of the stage is papered with pages from a book, arranged in rows on horizontal boards that can be opened like blinds. The stage is framed by more pages, rolled up like cigars. A couple of work desks, a raised lector platform, and an open stairway are the only set pieces. When the lector beings to read, the blinds open as the workers' minds and imaginations open, while the beautiful light of the world is let in. It's a world so beautiful it almost makes me want to smoke a cigar and read Anna Karenina (I've never tried the former but I did once try the latter, and failed). Playwright Nilo Cruz writes in an essay, excerpted in the playbill, "the art of listening to stories is analogous with dreaming," which is interesting because the first word that came to my mind at intermission is "dreamy." The writing of this play, and the Jungle's beautiful production that brings it to life, have a very dreamlike quality that prove his point. Storytelling is magical, it allows us to escape into other worlds, to imagine how other people feel. 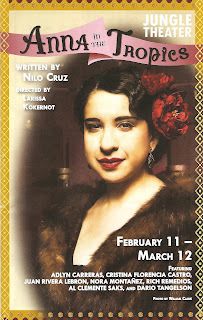 Such is the power of Anne Karenina for the factor workers, such is the power of theater over me. Anna in the Tropics continues at the Jungle Theater in Uptown (which means - allow plenty of time for parking in the crowded and busy neighborhood) through March 12.